The 5th period Personal Finance class visited Martha’s On A Roll when it parked across Lebanon Street from HHS on it first day of operation on May 16th. Broadside General Editor Dan Zegans is ordering a snack. Photograph by Hayden Smith. The first week of business for the latest addition to the Upper Valley food truck scene appears to have gone well. Even on a rainy Sunday morning by the Dartmouth Green in Hanover, a line of people (mostly Dartmouth students) could be seen outside the bright, orange mobile restaurant. Many were perusing its menu for the day, which included breakfast plates, snacks and pastries, and a vast array of melts and panini. The chef and namesake behind the new food truck known as Martha’s On A Roll is none other than Martha Esersky Lorden, a former social studies teacher at Hanover High School who retired in 2012 and has since been an avid student and teacher of the culinary arts. In a phone interview on a Sunday afternoon, Lorden explained her background with and passion for food. She said that she has had a great interest in food history, something that she tried to incorporate into the curriculum of some of her classes when she still taught at HHS. Having been certified in food history at Boston University, Lorden has also taught culinary history courses at the Co-op and at Dartmouth College through its OSHER program. However, something that Lorden really wanted to do was to run her own eatery. Originally, she thought about opening a diner, but later became inclined towards running a food truck. Then, as she recounted, Lorden was driving up Route 5 in Vermont one day when something caught her eye. “I spy an orange food truck for sale in Windsor,” she recalled, continuing, “I just kept driving… thinking ‘Oh my god! '” She looked up contact information for the truck’s owner online once she got home, and eventually purchased the truck in September 2017. The truck, a 1985 Chevrolet P30, has a storied past. Originally serving as a postal truck, the vehicle passed through the hands of many other chefs across New Hampshire and Vermont before Lorden bought it. 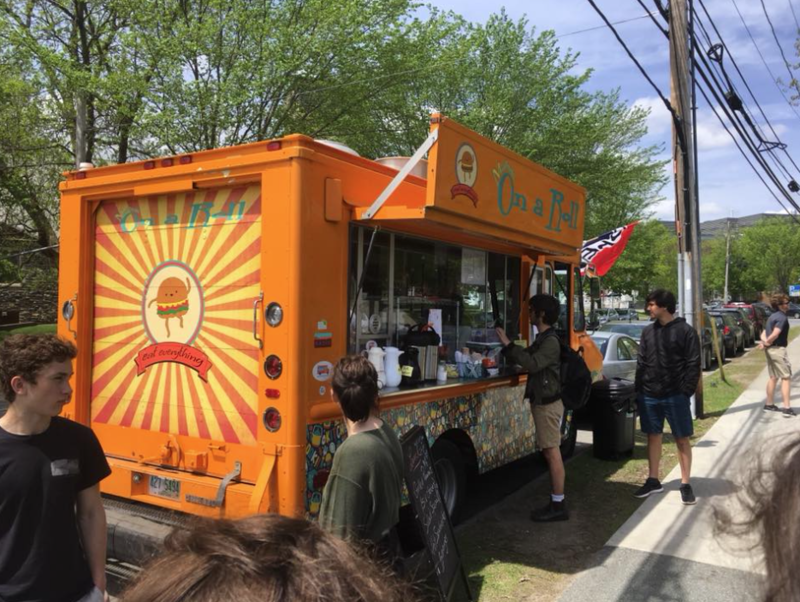 According to Lorden, her “big, orange piece of real estate” once served Mexican cuisine in Portsmouth, NH, as well as falafel in Burlington, VT, before becoming a brunch and lunch truck in Windsor. However, such a past often means greater needs for repairs, so Lorden spent much of the fall and winter “under the truck” to make the necessary fixes and adjustments. And now for the main attraction of truck: the food. Lorden told the Broadside that Martha’s On a Roll is currently serving a mix of “bistro sandwiches and gourmet melts” along with other snacks and beverages. The eatery serves separate breakfast and lunch menus as well. On May 20, its breakfast menu included $4 main dishes such as a breakfast panini and an eggs-and-bacon biscuit (all with a side of fruit) while its lunch menu was mainly made up of $8 melts and paninis served with chips and cole slaw. Lorden, however, said that she would like to shift the items on her menu over time and that she “wants to go international” by incorporating different cuisines into her cooking. She mentioned “Eat-a-Fajita” and Thai cuisine as possible pursuits for the future. She also stated that she wished to serve more soups and stews later on. Despite these difficulties, Lorden has enjoyed the first few days in the food truck. “I love that interaction with customers,” she exclaimed on the phone. She explained that she wants to teach diners at her truck to “eat everything” (a motto she plastered onto the truck itself) and to “not be a food snob.” She also said that she was grateful to her husband Bruce Lorden (a former social studies teacher at the Richmond Middle School) for helping her run the truck, especially during instances such as when she sent a panini flying from the grill or when she accidentally flipped over a coffee urn. Martha’s On a Roll is part of a new wave of food truck businesses popping up across the Upper Valley, something Lorden did not fail to notice. “It’s cool to be part of a food trend,” she told the Broadside. Her business joins other trucks such as Vermont Munchies and Boisvert’s Curbside Kitchen, all of which will take part in a 12-truck festival on June 22 in Lebanon. The festival is only one of Lorden’s many plans for the future. Other potential plans include hosting guest cooks as well as assisting non-profits (“cooking for a cause,” as Lorden called it). 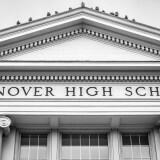 She also said that she hopes to have the truck operating near Hanover High School regularly, although finding suitable and legal parking nearby has been difficult (she can not park the truck in school parking on school days due to the non-competition clause in Hanover High’s contract with the company that provides its cafeteria services). Additionally, she plans to feed people attending Dartmouth football games in the fall. 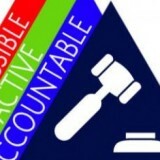 Great piece. Love Martha and her food, wish I were in Hanover right now.